To dream means to be bold, coura­geous, fear­less, sen­si­ble and above all, to believe in your­self. The dif­fer­ence between hav­ing a dream and to make this dream come true depends on the strength of your spirit — the belief in your­self, how much you want to achieve this dream, and what effort would you invest to make it hap­pen. This divine Strength of spirit dri­ves mankind to new horizons. My name is Atanas Ska­tov, I was born in 1978 in Sliven, Bul­garia. I’m an agron­o­mist and entomologist.I hold a Mas­ter degree in Plant Preser­va­tion from the Agri­cul­tural uni­ver­sity — Plov­div, Bul­garia and aPhD degree in Agri­cul­tural sci­ence from the Hum­boldt Uni­ver­sity of Berlin, Gemany,February 2005. 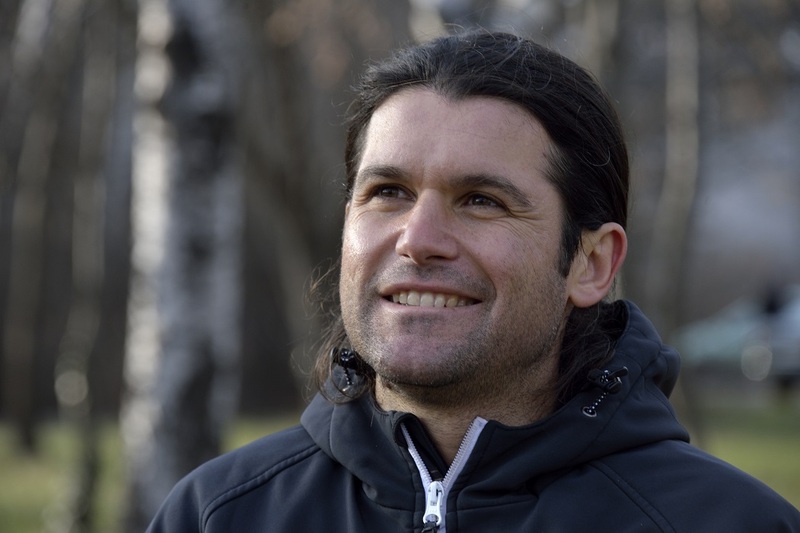 I have worked as a sci­en­tist in Bul­garia and Ger­many, as a uni­ver­sity teacher in Sofia and as a man­ager in the pri­vate sec­tor in Bul­garia and Germany. I am con­duct­ing an exper­i­ment with myself for sev­eral years and here I will tell you briefly about it. I do not claim that every­thing I do in my life is right quite to the con­trary, I am open to crit­i­cism and dis­cus­sions, because this way we are get­ting closer to the truth. The world is chang­ing every day, and we our­selves are chang­ing and noth­ing can be extreme in terms of state­ments and actions. It is impor­tant for any human being to have the cor­rect infor­ma­tion and to take deci­sions on his own. The exper­i­ment is sup­posed to test whether an ordi­nary per­son on vegan diet is able to over­come strong phys­i­cal and men­tal chal­lenges. The most impor­tant is to know if this diet regime is suit­able for mankind, because in this way we will be able to sig­nif­i­cantly lower or even dis­con­tinue the con­sump­tion of ani­mals, which is asso­ci­ated not only to many advan­tages and ben­e­fits for the human health, but also to pro­tect­ing the planet from global pol­lu­tion and find­ing a way to feed the increas­ingly grow­ing pop­u­la­tion of peo­ple on planet Earth.The agri­cul­tural land on which we grow our food and the food for the ani­mals we eat, is lim­ited and although new farm­land is devel­oped in some areas, in other areas this land is urban­ized and its sta­tus is changed mostly to indus­trial and res­i­den­tial use.Either way, the agri­cul­tural land can­not grow indef­i­nitely, it is lim­ited. But the pop­u­la­tion can grow as long as there is some­thing to eat. The major share of the cul­ti­vated agri­cul­tural land and the pas­ture lands are intended for ani­mal feed. If we reduce the con­sump­tion of meat and ani­mal prod­ucts, there will be more space for plant food for humans and thus the world’s pop­u­la­tion can grow twice as much. Another very impor­tant fact is that the indus­trial ani­mal breed­ing is a very big pol­luter on the planet. The destruc­tion of the ozone layer is mainly due to the methane, which is excreted by the diges­tive sys­tem of the ani­mals. Accord­ing to the United Nations data, the share of the green­house gases as a result of ani­mal breed­ing is about 50%.Billions of ani­mals are bred and eaten on the planet each year, and they are con­sum­ing 2⁄3 of drink­ing water and con­tribut­ing to the water pol­lu­tion and the entire planet. Also, in order to meet the needs of the mar­ket for meat and ani­mal prod­ucts, more forests and jun­gles are trans­formed into pas­tures or used for the needs of ani­mal breeding.This indus­try has become the largest con­sumer of drink­ing water and user of nat­ural resources. The exter­mi­na­tion and exploita­tion of ani­mals by humans is another impor­tant topic, which I do not want to dis­cuss at present. This planet is a haven for all ani­mal species and humans and every­one should have an equal chance to live on it with­out being grown for human consumption. I’ve been a veg­e­tar­ian since Jan­u­ary 2007, then at the begin­ning of 2012, I excluded all food of ani­mal ori­gin from my menu, except honey. Since May 1, 2015, honey has been also out of my diet. 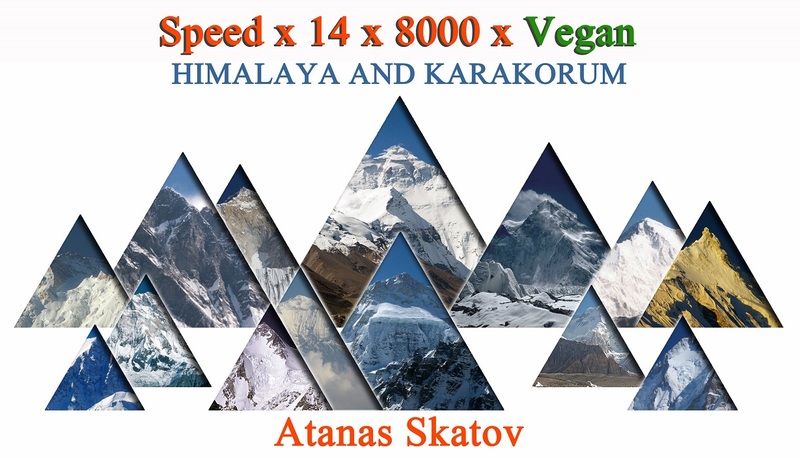 In order to test my body phys­i­cally and men­tally I chose the alpin­ism and orga­nized two projects — „SE7EN SUM­MITS VEGAN“and „Speed x 14 x 8000 x Vegan”, which are described in more detail at point 3 below. For me, the moun­tain is some­thing very spe­cial, where I have found every­thing I needed. There, I feel free, bal­anced, in com­fort with myself and I can reflect on every­thing that excites me and where I can find answers to the ques­tions that I am ask­ing myself.I feel that the moun­tain fills me up with energy and helps me to dis­cover very fine details of my char­ac­ter. So, I can only rec­om­mend it to those who have not touched the magic of the moun­tain yet, and are will­ing to do so, just do it.If it is not your place, just find your own place. Every­one has its place on the planet where he feels well bal­anced and in har­mony with him­self and the surroundings. It is very impor­tant to show that a man who have never played sports and have no coaches, lead­ers, teach­ers, man­agers and expe­ri­ence in the moun­tains, is able to achieve the desired results. At the begin­ning of 2012, I started to pre­pare for Sub­pro­ject 1, which envis­ages climb­ing the high­est sum­mits of the seven con­ti­nents on our planet with­out con­sump­tion of food of ani­mal ori­gin — as a vegan. Train­ings are con­ducted in Bul­garia and abroad. In order to develop and improve my phys­i­cal and men­tal con­di­tion and to acquire the nec­es­sary skills and expe­ri­ence I started prac­tic­ing moun­tain walk­ing, jog­ging, cycling and then added yoga, swim­ming and climbing. In regard to my health con­di­tion, I am con­duct­ing detailed med­ical and lab­o­ra­tory tests on a reg­u­lar basis. Addi­tion­ally, I keep records con­tain­ing descrip­tions of the phys­i­cal activ­ity, food con­sump­tion by type and quan­tity and other rel­e­vant details. My goal is to show to more peo­ple that there is another way of life besides the most com­mon one. That, if a man who had never done sports before could cope with one of the biggest chal­lenges – high alti­tude alpin­ism, it means that we can live a full life with­out ani­mal prod­ucts. Behind all this we can see the Strength of spirit and the unlim­ited human capabilities. The key goal of this project is to test whether the lack of ani­mal food in the diet of a human would adversely affect his phys­i­cal and men­tal capa­bil­i­ties.More­over, to check whether with­out the con­sump­tion of food of ani­mal ori­gin, the human organ­ism can func­tion well and can achieve even higher phys­i­cal and men­tal performance. Another goal of the project is to show that there are no impos­si­ble things and every­thing is achiev­able if you believe in it and if you make the nec­es­sary effort for that. To explore our own body and dis­cover what is best for it while try­ing to fully pro­tect the envi­ron­ment and live in har­mony with our­selves and the nature. To believe in our­selves and in the strength of our capabilities. This is whyI started climb­ing all the high­est con­ti­nen­tal sum­mits of the planet as well as all sum­mits higher than eight thou­sand meters with­out the con­sump­tion of food of ani­mal ori­gin from a man who has never been an ath­lete and has not prac­ticed any sports. To seek the lim­its of the human capa­bil­i­ties and the lim­its of the vegan which are directly related to the Strength of spirit and belief in the unlim­ited pos­si­bil­i­ties, are my top pri­or­ity. Every­thing must hap­pen first in the head and then to believe in it, and after that to apply it in practice. Start of the project: 01.01.2013. End of the project: 20.06.2017. • Climb­ing the high­est sum­mit on Earth – Ever­est, 8848 m, on 24.05.2014, and going down to camp ABC at 6440 m. on the same day; The first vegan in the world to climb Mount Everest. On 20th of June 2017 Dr. Ska­tov com­leted the Sub­pro­ject 1: “SE7EN SUM­MITS VEGAN” and become the first vegan of the world with this achiev­ment. Seven Sum­mits Summiter! Start of the project: 01.09.2015. End of the project: 31.12.2020. The first per­son to climb all 14 eight-​thousanders was Rein­hold Mess­ner, who com­pleted this project in 1988. It took him 18 years to climb all of the 14 sum­mits with­out the use of arti­fi­cial oxy­gen. For those 27 years, until now, a total of 34 peo­ple man­aged to set foot on all of the14 sum­mits, among which there are three women. Of those 34 peo­ple, 14 did not use arti­fi­cial oxy­gen while climbing.The fastest climb­ing of the 14 sum­mits up to now is done for eight years. Excel­lent phys­i­cal and men­tal prepa­ra­tion is needed for climb­ing each of these sum­mits, as well as con­sid­er­able amount of money. Even peo­ple con­sum­ing all kinds of food and hav­ing pro­fes­sional alpine train­ing have not climbed all 14 eight-​thousanders in such short period. I have been a vegan for more than five years and I can def­i­nitely say that for the time being I feel very well and at this stage I do not intend to change my diet regime. I con­tinue explor­ing new plant foods as well as their combinations.On the other hand, some doc­tors are shar­ing the opin­ion that at the moment my organ­ism is con­sum­ing the reserves of my body and after the 5th or the 6th year as a vegan, my organ­ism will suf­fer from health complications.I respect the opin­ion of the doc­tors, but for me it is far more impor­tant to test how my organ­ism will func­tion in the future. Of course, as I already said, this is an exper­i­ment and some­thing can be changed at all times, if nec­es­sary. I believe exper­i­ment­ing is needed in order to find the opti­mal solution. Every few months I am going through med­ical exam­i­na­tion and giv­ing blood sam­ples, in order to mon­i­tor the sta­tus of major health indi­ca­tors. The med­ical tests, I have been sub­ject to, does not show any­thing dis­turb­ing. The lev­els of vit­a­min B12 and cal­cium are nor­mal, just iron and biliru­bin are slightly higher. How­ever, I am tak­ing vit­a­min B12 twice per year for 3 months just as a pre­cau­tion­ary measure. For the period 2014 — 2016 I have made more than 20 pre­sen­ta­tions in var­i­ous Bul­gar­ian towns. My exam­ple con­tin­ues to attract young peo­ple who love the moun­tain and the healthy lifestyle and all those dream­ers who believe in them­selves, and who want to find them­selves, and through my exam­ple, I am clearly show­ing the real­iza­tion of the change to which they aspire. My mes­sage to all is to find what makes them happy and in bal­ance with them­selves and the envi­ron­ment. Any dream can come true, if you believe in it and you make the nec­es­sary effort. I want to show that there are no impos­si­ble things. Every­thing is pos­si­ble and let every­one believe in their dreams and the strength of their spirit. But let us reflect on ani­mal breed­ing, what it gives us and what it takes from us. For me it is impor­tant that all peo­ple have infor­ma­tion about the food, espe­cially of ani­mal ori­gin, and what are the results from its pro­duc­tion. How the ani­mal food got to the table and what did it cause. Then every­one can decide for them­selves what to eat and how to live on this planet. If this diet proves to be healthy for us humans, it could reduce the con­sump­tion of meat and ani­mal prod­ucts, which will lead to a huge reduc­tion in the pol­lu­tion of our planet result­ing from ani­mal breed­ing and pro­duc­tion of food of ani­mal ori­gin in indus­trial quantities.Also, agri­cul­tural land will be released and can be used for the pro­duc­tion of plant food and thus could help in solv­ing the prob­lem with the world hunger and the safe increase in the pop­u­la­tion on our planet. On the other hand, this will stop the destruc­tion of forests and jun­gles, which now takes place in order to pro­vide for the needs of ani­mal breed­ing and will reduce the con­sump­tion of drink­ing water supplies.Planting new forests and jun­gles could begin on the released agri­cul­tural land. The exper­i­ment is of great impor­tance to all mankind and the preser­va­tion of the nature on our planet. We have a unique planet, which is a won­der­ful place for the exis­tence of our human race. Unfor­tu­nately, with the glob­al­iza­tion and indus­tri­al­iza­tion, we are destroy­ing more and more the nature and espe­cially the ecosys­tems by build­ing vast and numer­ous ani­mal breed­ing farms. Every day plant and ani­mal species are dis​ap​pear​ing​.It hurts me for this planet and I want our chil­dren, grand­chil­dren and great-​grandchildren to have the same chance as me to enjoy the beauty and inspi­ra­tion of our nature, to share what I see now with my eyes, smell with my nose, feel with my skin and breathe with my lungs.Just let us all try to live as envi­ron­men­tally friendly as we can, and to try to pro­tect our planet from pol­lu­tion. No man can call him­self and to think about him­self as envi­ron­men­tal­ist while con­sum­ing food of ani­mal ori­gin at the same time. We have to go back to Mother Nature. She teaches us many things and gives us answers to a lot of ques­tions. We need to pro­tect the nature because we will lose it.